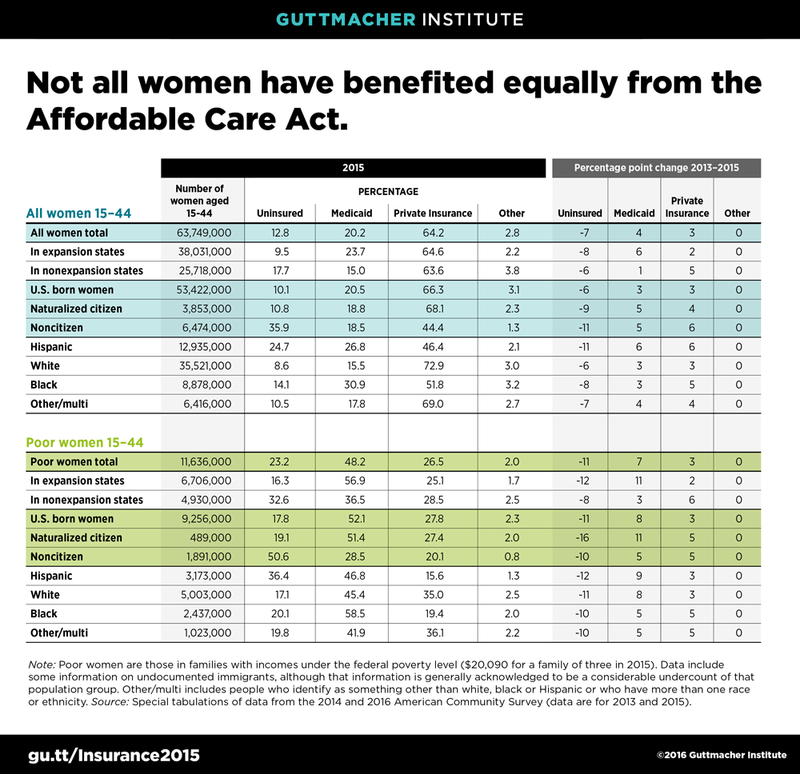 The proportion of women of reproductive age (15–44) who were uninsured dropped by 36% between 2013 and 2015, over the first two full years of implementation of the Affordable Care Act (ACA). This considerable decline in the uninsured rate, calculated by the Guttmacher Institute using data from the U.S. Census Bureau’s American Community Survey, mirrors broader national insurance trends, and was particularly pronounced in states that had expanded Medicaid under the ACA. However, despite these improvements, significant disparities in coverage persist based on women’s income, race or ethnicity, citizenship status and state of residency. And all of these improvements would be endangered if the ACA is scaled back or eliminated under the next administration. Overall, the proportion of reproductive-age women without health insurance fell from about 20% in 2013 to 13% in 2015; all told, 8.2 million reproductive-age women were uninsured in 2015. The change was driven by substantial gains in both Medicaid coverage and private insurance. Medicaid, the federal-state health insurance plan for low-income individuals and families, covered 20% of reproductive-age women in 2015, or 12.9 million women. Gains in insurance coverage among reproductive-age women who live below the poverty line were substantial as well, with a 32% drop in the proportion who were uninsured and an 18% increase in the proportion covered by Medicaid. That program covered nearly half of poor women aged 15–44 in 2015. Despite these overall improvements, poor women of reproductive age were almost twice as likely to be uninsured in 2015 as reproductive-age women overall. Other disparities in coverage persist, as well: Hispanic women of reproductive age were far more likely than white or black women to be uninsured in 2015. Hispanic and black women were considerably more likely than white women to have Medicaid coverage, while white women were most likely to be privately insured. Immigrant women of reproductive age who had not obtained citizenship status had more than three times the uninsured rate of U.S.-born women in 2015. That gap grew wider between 2013 and 2015, because many immigrants are barred from eligibility for subsidized private coverage under the ACA and for Medicaid coverage. In fact, more than half of poor noncitizen immigrant women aged 15–44 remained uninsured in 2015. 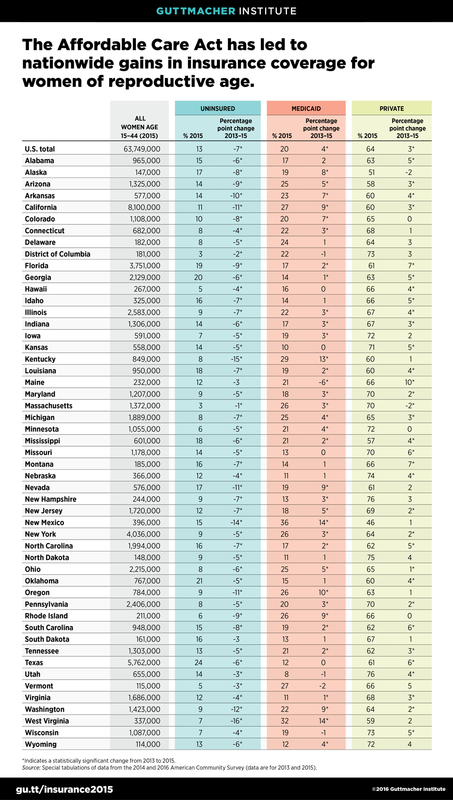 At the state level, improvements in insurance coverage across the country are tied to the ACA’s coverage expansions, particularly the major Medicaid expansion now adopted by 31 states and the District of Columbia. The uninsured rate declined significantly in almost every state in the country between 2013 and 2015. Yet, collectively, states that implemented the ACA’s Medicaid expansion experienced both steeper declines and lower overall 2015 levels in their uninsured rate. Notably, although Medicaid expansion states on the whole had higher levels of Medicaid coverage than nonexpansion states even prior to the ACA, that gap widened further by 2015. These gains in insurance coverage have major implications for access to health care in general and to sexual and reproductive health care in particular. That is because Medicaid and private insurance include robust coverage for many sexual and reproductive health care services, including family planning services and supplies, without out-of-pocket costs for enrollees. The ACA’s impact is also being felt among safety-net family planning providers, as increasing numbers of family planning visits are covered by insurance. A separate analysis of data from a group of 28 safety-net centers supported by the Title X program found that the overall proportion of uninsured client visits at these centers decreased from 44% during the last three quarters of 2013 to 33% during that same period in 2015, driven by increases in visits paid for by both Medicaid and by private insurance.